IN THE dozen years between 1933 and 1945, at least 6,000,000 Jews were murdered in a systematic and organized act of genocide that is unprecedented in history. Jewish communities from Poland in the north to the Mediterranean Sea in the South were decimated, as the armies of the National Socialist (Nazi) Party destroyed European life and culture. The Nazi goal was elimination of all Jews from Europe; in some ways this became an overriding objective to the pursuit of conquest that marked World War II. Anti-Semitism, an endemic part of European life for centuries, was transformed from religious and ethnic prejudice into a racial attack that segregated the Jews and returned them to their medieval legal status by removing the rights of citizenship granted in the 19th Century. Isolated, without a land to call their own or open borders to enable them to take up life in other countries, Jews were trapped in the iron fist of storm troopers and party faithful, as well as suffering torment at the hand of ordinary citizens of Germany, Austria, Poland, Czechoslovakia, the Baltic Countries of Lithuania, Latvia and Estonia, in addition to many former territories of the Austro-Hungarian Empire along the length of the Danube River and to its south. The Jews of Germany began emigrating shortly after the Machtergreifung – Nazi seizure of power-on 30 January 1933. By the time of the Reichspogromme – Night of Broken Glass, or Kristallnacht – 9-10 November 1938, nearly half of the 550,000 Jews registered in the census of 1930 had fled; sadly a substantial number took refuge in France, the Netherlands and Czechoslovakia, only to be caught once again in the vice following the Nazi expansion by occupation (Saarland-1934; Czechoslovakia 1938; Austria 1938) and the outbreak of World War II on 1 September 1939 (Poland); months later expansion to the west brought more Jews into the net as the Nazi forces swarmed around the flawed Maginot Line (France, Belgium, Luxembourg and the Netherlands, May 1940). A great meeting of nations called to Evian in late 1938 brought only an offer from the Dominican Republic to take in additional refugees (cf. Hans Habe, The Mission). The United Kingdom offered a safe haven to orphaned children that has come to be known as Kindertransport – Children’s Evacuation. Jews who had succeeded in reaching areas of safety-France, and the United Kingdom often faced imprisonment as enemy aliens, while the Centralrat der Deutschen Juden under the leadership of Rabbi Leo Baeck and its affiliates used all available means to help Jews flee from Germany. A refuge of last resort became Shanghai as no entry visa was required. The Nazi police state used incarceration, intimidation and violence to quell any resistance. Political opponents, known socialists and leftists, homosexual men, Sinty and Romany (commonly called gypsies) were arrested and interned in concentration camps including Dachau, Sachsenhausen-Oranienburg and many others throughout Germany. Once World War II began, substantially larger numbers of Jews fell within Nazi control leading to the establishment of the ghettoes – virtual prison towns – at Warsaw and in many other places, in which Jews were isolated, starved and left prey to communicable diseases in unsanitary and crowded conditions. Others fell prey to Einsatzgruppen -storm troops – whose firing squads humiliated and killed mercilessly, most infamously at Babi Yar, a hilly section on the outskirts of Kiev, the Ukraine. In January 1942, meeting at a lakeside villa at Wannsee in the western reaches of Berlin, leadership including Adolph Eichmann met and agreed to put into place the EndlÃ¶sung der Judenfrage-the Final Solution for the Elimination of the Jews. The plan, put into effect by Eichmann, was to kill many at once. This was initially accomplished using carbon monoxide from vehicles to suffocate victims locked in the rear of the truck. A short time later gas chambers were erected at camps outside Germany – Auschwitz-Birkenau, Sobibor, Matthausen are among the better known-where mass murder took on an assembly line character. The last act of indignity to those so brutally and unjustly put to death-without regard to age, gender, social standing, or religious affiliation-was cremation. The Nazi system of KZ-Concentration Camps included hundreds of locations. While some were death factories, most were places of hard labour, starvation and emotional deprivation. 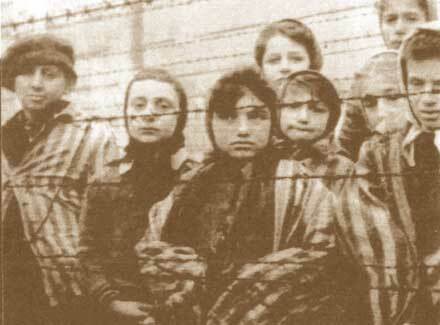 While a small number of accounts have emerged over the years depicting tsaddikei umot ha’olam – Righteous Gentiles – and survivor accounts have verified that these events are historical and without a doubt have taken place, most of the population in Germany and the vast swath of Europe occupied by the Nazis and their allies was at best indifferent to the plight of the Jews. The long night of horror ended on 8 May 1945 when Berlin finally fell as troops-British, Canadian, French, American, & South Africans from the west and Soviets from the east-met at Berlin’s Brandenburg Gate. The Nazi leadership was largely dead-often by suicide; others took refuge in South America, including Adolph Eichmann who was later arrested in Argentina and put to death after trial in Israel (see: Man in a Glass Booth, by Ralph Hochhuth; and The Banality of Evil, by Hannah Arendt). The relatively few who survived the death camps and work camps were gathered and nourished, but reduced to living skeletons many perished quickly following their ordeal, while others finally succeeded in emigrating from Europe. Those who had no place to go found themselves trapped in Occupied Europe and became residents of DP Camps (displaced persons). Without proper identity papers and with no safe return to former homes, their anguish continued. The plight of these refugees, along with those interned in process of illegal immigration in Cyprus, Mauritius and other places, was only relieved after the establishment of the State of Israel, where under the Law of Return many made their way to build a Jewish State. Memorials to the Shoah, as the Jewish community knows this complete destruction, include Israel’s Yad Vashem, the arched shofarot in Johannesburg’s West Park Cemetery, and sites throughout cities and the countryside of Europe. Train stations, houses, quays, and ordinary buildings often bear inscriptions marking their role as places of deportation, degradation and death. In more recent years, Holocaust museums and Memorials have been dedicated and draw large audiences in Washington, DC (US Holocaust Memorial Museum), Berlin, New York (Museum of Jewish Heritage), and the exhibition at Israel’s Yad Vashem has been completely revamped to a modern museum standard. Although many of these museums were initially planned and envisioned as recording the fate of Polish Jewry alone, a broader and more historically accurate approach has been followed. Many memorial installations have faced substantial controversy, and millions of words have been written about the events, the victims, the survivors and the perpetrators. A recorded library of interviews with survivors bears the name of Steven Spielberg. Early in the history of the State of Israel, 27 Nisan was designated as a day of memorial to the victims of Nazi hatred and terror. The date recalls the collapse in 1943 of the most important anti-Nazi uprising among the resisters-the Warsaw Ghetto Uprising. In Israel, at mid-morning, sirens sound throughout the country. Traffic stops, life is put on hold and for 3 minutes in that silence, the dead are remembered in hopefulness and solemnity. In Gates of Prayer a special service of commemoration recognized the enduring significance of these events for the Jewish community around the world. “Never Again!” is a slogan that might well be attached to this moment of memorial: never again genocide, never again silence when others face destruction, never again a homeless and wandering Jewish people. But for all time the prophetic imperative of the quest for justice, for equality and an end to oppression.